You can easily walk across the sand on a beach. But step into a ball pit, and chances are you'll fall right through. Sand and ball pits are both granular materials, or materials that are made of collections of much smaller particles or grains. Depending on their density and how much force they experience, granular materials sometimes behave like liquids—something you fall right through—and sometimes "jam" into solids, making them something you can stand on. "In some cases, these little particles have figured out how to actually form solid-like structures," said Robert P. Behringer, James B. Duke Professor of Physics. "So why don't they always just go squirting sideways and relax all the stress?" Physicists do not yet understand exactly when and how jamming occurs, but Behringer's team at Duke is on the case. The group squishes, stretches, hits, and pulls at granular materials to get a better picture of how and why they behave like they do. The team recently presented a whopping 10 papers at the 2017 Powders and Grains Conference, which occurred from July 3-7, 2017 in Montpellier, France. Many of these studies use one of the lab's favorite techniques, which is to create granular materials from small transparent discs that are about half an inch to an inch in diameter. These discs are made of a material which, thanks to the special way it interacts with light, changes color when squished. This effect allows the team to watch how the stress within the material changes as various forces are applied. 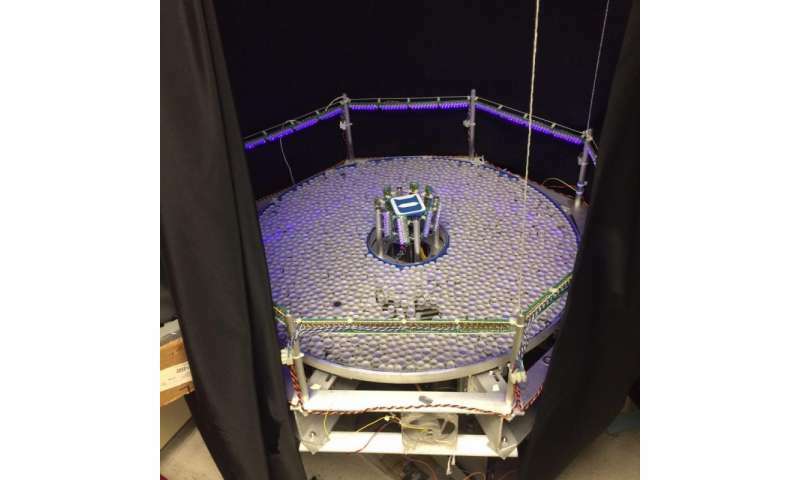 In one experiment, graduate student Yue Zhang used a high-speed camera to catch the stress patterns as a ball on a string is yanked out from a pile of these discs. In the video, the ball first appears to be stuck under the pile, and then suddenly gives way after enough force is applied—not unlike what you might experience pulling a tent stake out of the ground, or opening the lid on a pesky pickle jar. "The amusing thing is that you start trying to pull, you add more force, you add more force, and then at some point you pull so hard that you hit yourself in the head," Behringer said. The team was surprised to find that the stress patterns created by the ball, which Behringer says look "like hair all standing on end," are almost identical to the stress of impact, only in reverse. "What you see is even though you are just gradually gradually pulling harder and harder, the final dynamics are in some sense the same dynamics that you get on impact," Behringer said. In another experiment, the team examined what happens in granular materials under shear strain, which is similar to the force your fingers exert on one another when you rub them together. Graduate student Yiqiu Zhao placed hundreds of these discs onto a circular platform made of a series of flat, concentric rings, each of which is controlled by a separate motor. As the rings turn at different speeds, the particles rub against one another, creating a shear stress. "We have about twenty stepper motors here, so that we can rotate all the rings to apply a shear not only from the outside boundary, but also from everywhere inside the bulk of the material," Zhao said. This ensures that each particle in the circle experiences a similar amount of shear. "One of the key intents of this new experiment was to find a way that we could shear until the cows come home," Behringer said. "And if it takes a hundred times more shear than I could get with older experiments, well we'll get it." As the rings turn, videos of the material show forces snaking out from the inner circle like lightning bolts. They found that by applying enough shear, it is possible to make the material like a solid at much lower densities than had been seen before. "You can actually turn a granular fluid into a granular solid by shearing it," Behringer said. "So it is like you don't put your ice in the refrigerator, you put it in one of these trays and you shear the tray and it turns into ice."